Community, Leadership, and Listening | "A Song Every Day"
Posted on January 9, 2015 by vspatz	in Ethics, racism, Shemot, white allies and tagged #blacklivesmatter, BlackLivesMatterDMV, Exodus, Jews United for Justice, Moses. 1) Moses sees an Egyptian man striking a Hebrew; he responds by killing the Egyptian and then hides the deceased in the sand. 2) Moses sees two Hebrew men fighting and tries to stop the aggressor. 4) Pharaoh learns of Moses’ crime and sets out to kill him. Moses flees from Egypt. We don’t know, from the text itself, if Moses’ upbringing included grooming in Egyptian leadership skills or if he was taught Israelite ideas and practices through a continuing relationship with his birth parents. Commentators over the centuries have understood his early years in both ways. We do know that Moses “went out unto his brethren and looked on their burdens [וַיֵּצֵא אֶל-אֶחָיו, וַיַּרְא, בְּסִבְלֹתָם]” (Exodus 2:11). What is not reported is any interaction between Moses and his brethren — or between Moses and the Midianite women at the well — that would help him understand community perspectives and concerns. He seems to have some sort of innate sense of justice, but he isn’t able to turn that inner sense into action that is helpful when faced with real world circumstances. Like Moses, many attempting to understand and join the #BlackLivesMatter struggle don’t know how to translate a desire for justice into action that is helpful. The first step, the one Moses seems to have missed initially, is to LISTEN. Here, for those interested in taking this step, are video clips from Jews United for Justice’s “Black Lives Matter, Chanukah Action” program. Hear directly from black activists about their experiences and their advice for white allies. More on the event and full list of speakers. 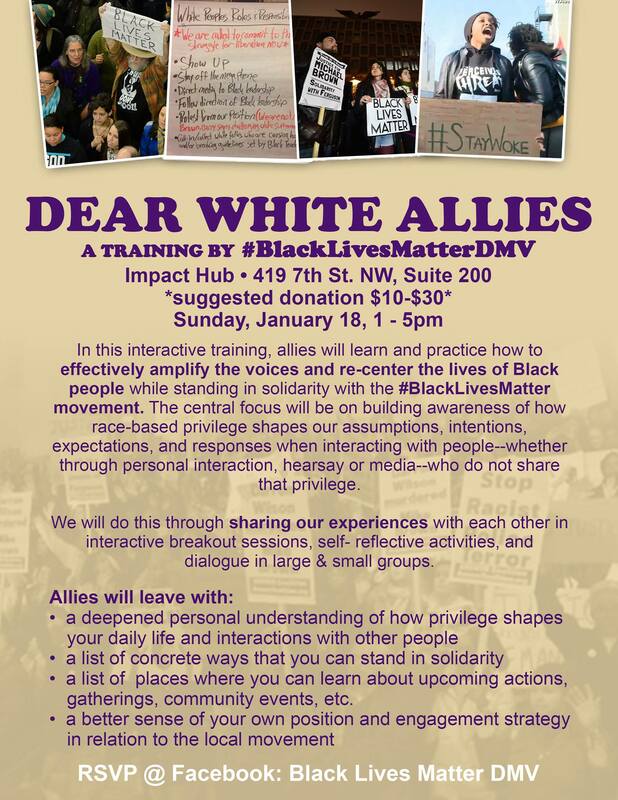 For those in the DC area, consider joining “Dear White Allies: A Training by #BlackLivesMatterDMV” or one of the many other local opportunities to listen and learn. For those beyond DC, look for local anti-racism and white ally training in your area.